Clairden is an asymmetrical 2½-storey, Tudor Revival Arts & Crafts house. It is bellcast-hip-roofed and has three flat-roofed and one hip-roofed dormers. There is a two-storey wing on the right side with a one-storey, hip-roofed bay on the main floor to which a flat-roofed entry is attached. The left rear has a long extension and several one-storey box bays. The left side of the house has a full-height box bay towards the front. The front façade has a full-height, shallow, hip-roofed box bay to the right of the recessed main entry porch. There is a hip-roofed canopy over the exterior portion of the porch, which has front-facing stairs offset to the left. To the left of that is a deeply hip-roofed box bay. A high belt course separates the stucco and half-timbered upper level from the shingled main floor. The shingles extend to the low water table over the concrete foundation. The concrete-capped stone terrace in front of the house, which bordered a garden, now borders a driveway. It was built for $18,000 and the 1922 alterations were for $900. 1911-18: Simon Leiser (1851-1917) was one of Victoria’s pioneer merchants. In 1868 he came from Germany to Wisconsin, where his uncle Jacob Lenz was an established wholesale liquor dealer. By 1872 Simon was managing two stores and the Chicago office of his uncle’s business. He met Jacob’s daughter Caroline (1856-1935); they came to BC in 1873 and married six years later. After a brief stint in the coffee business in Victoria, Simon headed for the Cassiar District, where he won a contract to build a 100 km trail from Telegraph Creek to Dease Lake. He opened his first grocery store during this period with Jacob Lenz, and during the 1870s operated up to four stores in the Cassiar District, where he catered to the many miners in the region. Simon came to Victoria in 1880 and established a grocery business on Johnson St. The success of this business prompted him to enter the wholesale business as Simon Leiser & Co in 1894. 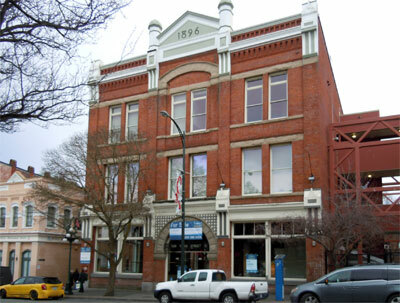 In 1896 he moved his business to 522-524 Yates St, Downtown, the block that bears his name. It was the largest wholesale grocery business in BC during the 1890s, employing about 100 people on Vancouver Island alone, although his business extended east into the Kootenays and north to Alaska. The 1890s were particularly prosperous during the Klondike Gold Rush when Simon supplied the many miners in the region. He expanded into the sealing trade, eventually becoming director of Victoria Sealing Co. The seizing of his vessels the Wanderer and the Favorite by the US Government in 1894 precipitated international negotiations that led to the end of open-ocean seal hunting. An active member of the Board of Trade, Simon became president in 1909. During his two terms, he promoted the building of Victoria, particularly the Inner Harbour. Simon’s other interests included the Royal Jubilee Hospital, Victoria Opera House and Royal Theatre. But in May 1915, the night after Germany sank the Lusitania on which 13 Victorians died (including 21-year-old Jim “Boy” Dunsmuir, scion of the Dunsmuir family), angry crowds rioted downtown, ransacking buildings and businesses owned by German-born citizens. Two of Simon’s buildings on Yates St were badly damaged and the stock looted. Simon died at his daughter’s residence in Vancouver. His son Herbert Leiser lived in this house in 1918 with his mother Caroline. In her youth Caroline was a noted pianist. She was engaged in various philanthropic activities, including the Aged Women’s Home, the Women’s Auxiliary of the Jubilee Hospital, the Sisters of St. Ann and various Jewish organizations. 1919-22: George Gordon Bushby (b. Victoria 1869- 1932) and Violet Carlotta (née Brae, b. Sheffield, ENG 1876-1955) married in Calgary in 1908. Violet came to Canada in 1892. George was the grandson of Sir James Douglas and the son of Arthur Thomas Bushby, an accomplished musician and key political figure in BC’s early history. George studied engineering in England and San Francisco and began his career with his sister, Annie Bushby Bullen, her husband William Fitzherbert Bullen and his brother Harry Frederick Bullen (1007 Joan Cr, Rockland, 906 & 908 St. Charles St) as a partner in the BC Marine Railway Co. George established a branch of the firm in Vancouver in 1898, and stayed there until he sold his interests in 1919. 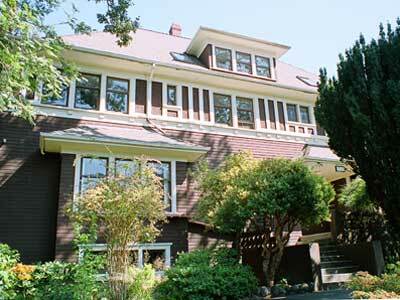 The Bushbys bought this house for $50,000 and lived in Victoria for several years, then moved to Prince Rupert in 1921. George established Rupert Marine Products, a fishery production plant, and operated the facility for 10 years until ill health forced him to retire. 1922-28: Elliott Torrance Galt (b, Sherbrooke, QC 1850-1928) was one of 13 children of Sir Alexander Tilloch and Amy Gordon Galt, and the brother of John Galt (1320 Rockland Av) who retired to Victoria in 1920. Alexander, Canada’s finance minister in 1868, was a Montreal businessman. In 1879–80 Elliott travelled the prairies as assistant to Edgar Dewdney (1759 Rockland Av), Indian Commissioner for Manitoba and the Northwest Territories. With his father, Elliot opened the first large coal mines in southern Alberta, and established the town of Lethbridge. Elliott was responsible for turning a large portion of Alberta’s native praire into productive agricultural land. In 1903 he became president of Alberta Railway & Irrigation Co, which combined the family’s mining, irrigation and railway interests. In 1912 the CPR bought them out. Elliott later made his home in New York, where he died in 1928. Lethbridge has honoured him by naming their museum the Galt Museum and Archives. 1922-59: Selina Galt (1863-1959) and Muriel Galt came to live with their unmarried brother Elliott, and inherited the house when he died. Selina lived here until her death. Clairden was converted to the 10-suite St. Charles Lodge apartments for $8,500 in 1959-60 by J. Frenchetti.